The Lion, The Hobbit, & the Ghost Writer – just love. CS Lewis is one of the most brilliant minds this world has ever seen. His work has intrigued millions, and continues to touch lives through his books and now his films. Imagine how amazing it would have been to be a fly on the wall at an Inkling gathering. 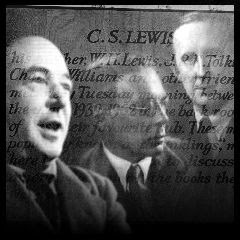 To listen to the musings of such authors as Lewis, J.R.R. Tolkien, and Charles Williams. Imagine the creativity that poured out of these men as they critiqued one another’s writings, shared ideas, thoughts, and theology. Just think what came about in terms of Christian symbolism through Lewis and Tolkien’s writings. These stories alone show the amazing sacrifice that Christ made for mankind. Thanks, Hayley! Many of those quotes were familiar to me, but some I had not read before. I just love it when an author so beautifully communicates thoughts in my mind that I’ve been unable to translate into words. CSL was absolutely freaking BRILLIANT and your post reminded me that I haven’t read anything of his in awhile…off to dust off some old books and crack ’em open again.What’s your favorite of his? I have to say I still love the Narnia stories…always have always will. But I just recently purchased The Problem of Pain which is amazing, and Mere Christianity…its hard to choose!I did hear they are making a movie of The Screwtape Letters, which should be incredible.